What were the main events of October 1973? Jackie Stewart achieved his third Formula One World Driver's Championship, after which he retired; war was raging in the middle east; U.S. president, Richard Nixon, reluctantly released the first tapes relating to the Watergate enquiry; 'Daydreamer' David Cassidy was in the singles charts, and we were buying LPs by the likes of Rod Stewart, the Stones, Slade, the Quo, David Bowie, Roxy Music, Elton John, Yes and Led Zeppelin, often in gatefold sleeves with amazing artwork. In the Grantham area there had been a lot of talk about a new scheme which would turn some of the former ironstone mining countryside around Buckminster and Market Overton into a local leisure amenity, including an ironstone mining museum and a railway preservation centre. Optimism was fuelled when A3 No. 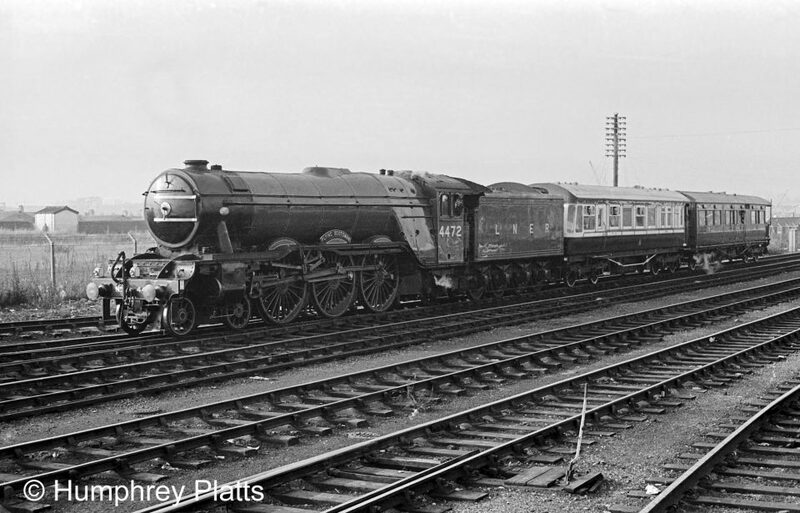 4472 Flying Scotsman arrived at Grantham station for a one night stopover before moving on to a steam depot being established at Market Overton in Rutland. Humphrey Platts was there, and he has kindly sent us some photographs, which are real gems. They seem to capture the anticipation of a dream which, sadly, was not to be realised.